Universal Newsline - Business, Lifestyle, Entertainment : Alpenliebe Juzt Jelly brings to life Jelly ki Duniya! Alpenliebe Juzt Jelly brings to life Jelly ki Duniya! New Delhi, October 24, 2014: Perfetti Van Melle has always been known for creating advertising that stands out with its wit and freshness. And the latest Alpenliebe Juzt Jelly campaign, conceptualized by McCann, is no exception. It unfolds in a unique visually-stunning jelly world where it is possible to do things that are not possible in the world we live in, making the jelly world so fascinating. 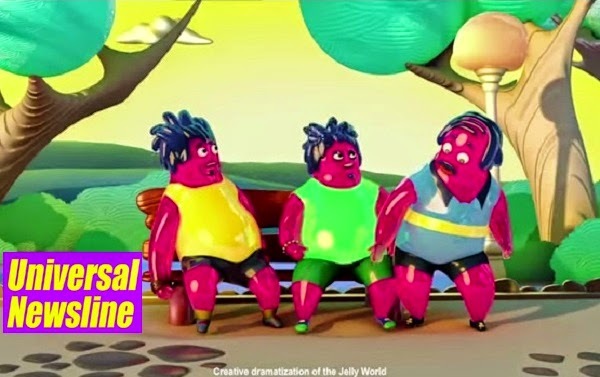 With characters made out of jelly, the campaign brings to life jelly’s colorful, wobbly, malleable and translucent characteristics. The campaign TVC focuses on the everyday, inane situations that surprisingly become exciting in the jelly world aptly capturing the campaign theme ‘Jelly ki duniya, mast duniya’. Prasoon Joshi, Chairman McCann Worldgroup Asia Pacific, CEO & Chief Creative Officer India added “Juzt Jelly is a product which has already clicked with the consumers. We are really excited with this new campaign which will surely make an endearing bond with the target audience. Our creative director Kapil Batra along with his team and film director Rajesh Krishnan have really worked hard on this campaign. It’s always a joy for McCann to work with Perfetti and this is one more nugget from this partnership”. Rajesh Krishnan, Director Soda Films commented “This has been one of the most challenging jobs for us. Contrary to belief, animation is a bigger animal to tame than a day’s shoot, as is the case in case of regular TVCs. All in all, we at Soda Films are happy the way this has turned out”. For over two decades, Perfetti Van Melle India Pvt. Ltd. (PVMI) has been a leading name in the Indian confectionary industry. With a clear focus on the discerning Indian taste, it has delighted one and all with innovative and quality products. A valuable addition to this tasty bouquet was Alpenliebe Juzt Jelly. Alpenliebe Juzt Jelly is now available in multiple flavors –Strawberry,Guava,Orange and Lychee.